Migrating Windows 10 to smaller SSD is one of the best ways to optimize computer performance. AOMEI Backupper is the most efficient too to realize this function. Why migrate Windows 10 to smaller SSD? Migrating Windows 10 to smaller SSD is transferring your Windows 10 by cloning it to SSD. The reason why we want to this concludes many aspects. The following are the detail points. ● Firstly, we can improve computer performance by migrating Windows 10 to smaller SSD. It is determined by the features of SSD. SSD does not have mechanical components, therefore, its speed of reading and writing is much faster than traditional hard drive. ● Secondly, migrating Windows 10 to smaller SSD is much faster than reinstalling new operating system on your SSD. We all know reinstalling operating system is time-consuming. Besides, you can not restore your original settings of your original Windows 10. So it is the best choice to migrate Windows to SSD. How to migrate Windows 10 to smaller SSD? 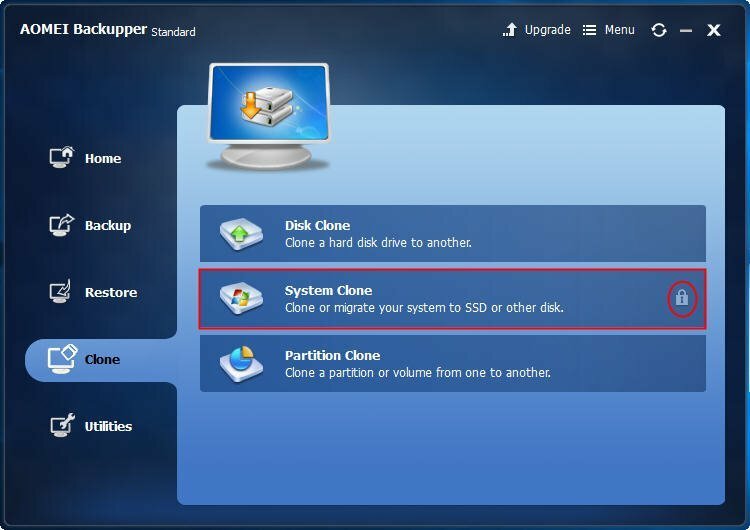 As we have mentioned above, to migrate Windows 10 to smaller SSD is to clone your system partition to the smaller SSD. Now the question we should consider is which clone tool is the best for the migrating. After carefully researching different kinds of clone tools, we find a clone tool - AOMEI Backupper which has perfect partition clone function. And its delicate designed interface and wizard make it an easy to use software. 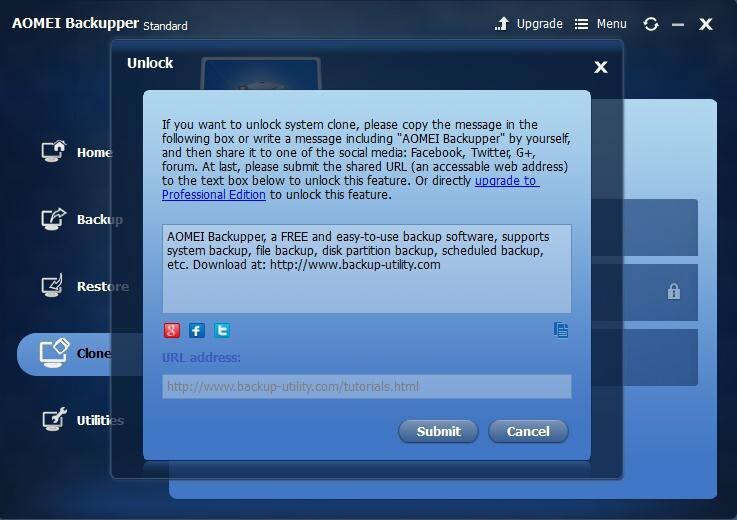 Besides, AOMEI Backupper offers multiple functions for free. So AOMEI Backupper is the most suitable clone software for migrating Windows 10 to smaller SSD. It is a good habit to backup data before any operation about your data. To ensure your data security, you can backup data to external hard drive using Disk Backup function of AOMEI Backupper before migrating Windows 10 to smaller SSD. Now I will show you how to migrate Windows 10 to smaller SSD. Step1. Download AOMEI Backupper, install it. Plug your SSD into your computer using an SATA cable. Then launch AOMEI Backupper, click the System Clone under the Clone option. And you need to unlock this function by sharing this software to one of your social media: Facebook, Twitter and so on. Step2. The program will automatically selects the system partition and system reserved partition. You do not have to select the source partition. Then select a destination place to save the source partition. Here it is the SSD(Disk 1). Step3. You will see an Operation Summary which indicates the operation that will be executed. Confirm all settings are right and click Start Clone. Click Finish when the clone process is done. ● Besides backing up your original hard drive, it is also important for you to backup your data on SSD. Because when clone hard drive to SSD, the SSD will be overwritten or deleted. ● And most importantly, confirm the capacity of SSD can store the Windows 10. Or the clone will not success. ● And in the bottom of the Operation Summary, you can set the detail of cloning process. And it is highly recommended to check the Align partition to optimize for SSD.